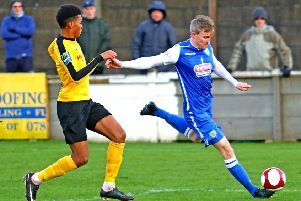 The points were shared in an entertaining match at Giant Axe between the Lancaster City and Saturday’s visitors Barwell. With chances at both ends and two sides both going for the win, some excellent goalkeeping prevented either side from snatching victory. City were on the front foot in the first half and took the lead after 20 minutes thanks to the in-form Charlie Bailey. Out-muscling his man on the left-side of the box the attacker cut inside the area and curled a precise effort just inside the foot of the right-hand post. Phil Brown’s side had chances to extend their lead before the interval. Sam Bailey drew a save from Canaries’ keeper Liam Castle with a free header at the back-post which maybe should have found the net, but instead was gloved away by the visiting shot-stopper. At the other end, Dollies’ ‘keeper Josh Powell was in great form to acrobatically tip Brady Hickey’s effort from the edge of the box around the post before denying the striker from an overhead kick. On the stroke of half-time there were strong penalty appeals from the home side as Glenn Steel’s goal-bound header was blocked by the arm of a defender. The appeals were waved away as the block was deemed not to be deliberate and the sides went in level at half-time. The second half saw a reverse in the fortunes of play as Barwell created the majority of chances and were level five minutes after the restart. Hickey finally got the better of Powell as his close-range effort found the net off the underside of the bar. Jake Heath then nearly gave the visitors the lead as his scrambled shot was deflected by Powell then cleared off the line. As the game wore on Nigel Julien should have done better, directing a free header well over the City goal, before a super double-save from Powell kept the Dolly Blues in the game. Charlie Bailey nearly won the game for City with a fantastic scorpion-kick attempt from 12 yards but the effort was matched by a flying save from Castle. Both sides had chances in the final stages to win the game but the defences and goalkeepers came out on top in a pulsating second half, leaving the spoils deservedly shared. Warrington Town’s FA Trophy replay with Ebbsfleet United means Lancaster’s proposed trip to Cantilever Park in the second round of the Integro League Cup tonight, Tuesday, has been postponed. Brown’s side are next in action with a double header of Evo-Stik Premier Division games against Nantwich Town, the second being played at Giant Axe next Tuesday night, January 23.